A few days ago, I showed you some flow banding in pseudotachylyte near Dobbins Lookout in the South Mountains, south of Phoenix, Arizona. I’d like to return to the South Mountains today for a more comprehensive look at the rocks exposed there. The South Mountains offer a geometrically-relatively-simple example of a metamorphic core complex. Photo-wise, let’s start with this outcrop, which offers a good starting point for thinking about metamorphic core complexes. There you see a granite, and a deformed granite. Granite is an igneous rock: one of those rocks that forms from the slow crystallization of magma, deep underground. The undeformed granite is equigranular, meaning its crystals are about the same size and the same shape in every direction. But as you work your way down through the photo, the rock takes on more foliation, and the size of the big chunky feldspar crystals is reduced dramatically. Quartz crystals are “ribboned” out into long wraithlike things. This is what a granite looks like when you smear it out. The exact boundary between the granite and the smeared-out version of the granite is impossible to put your finger on here – the deformation is progressively more and more pronounced from top to bottom in this photo. By the time we’re at the bottom, though, we’ve got a mylonite. Mylonite is a structural rock term; it’s independent of the composition of the rock that got deformed. Mylonites can form from igneous rocks (as here) or from sedimentary rocks, or from metamorphic rocks. If they can smear out, they can hope to someday be lucky enough to be transformed into mylonite! Mylonites were first described at Loch Eriboll in Scotland’s Northwest Highlands, where Charles Lapworth gave them their name and interpreted their fine grain size and foliation to be the result of thrust faulting. Rather than faults being crisp breaks in the crust, sometimes they could be broader zones of smeared-out rocks that accomodated the relative movement between two big blocks of rock in a diffuse zone of deformation. Lapworth’s insights helped solve the mystery of the Northwest Highlands (how Moine schist ended up on top of a Cambrian sedimentary sequence), and it gave the world a new way of looking at faulting – not only in terms of orientation (bedding-parallel) but also in terms of diffusivity. It’s worth mentioning that mylonites are often lineated as well as foliated. While I’ve been showing you photos of the trace of the foliation surface so far, I can also aim the camera lens right down onto that foliation surface, and look at the lineations lying within it, like pencils aligned on the surface of a desk. These are mineral stretching lineations, and they point in the direction in which the rock was elongated. In the South Mountains, that’s an east-northeast/west-southwest orientation, and it’s the direction the hanging wall block slid off the top of the metamorphic core complex. In other words, it’s the direction of crustal extension. There’s some serious grain size reduction between the first lineation photo and the second. That’s mylonitization for you! Grain sizes are dramatically reduced as the rock’s constituent minerals are “milled out” and smeared into wispy blebs. How simple the geology is in this range: there are essentially two rock types. How the mylonitic foliation in the cross-section is almost parallel with the surface in the middle of the section, but dips ever-so-gently more steeply to the right (east-northeast). There are scraps of breccia atop the mylonitized granite in several places. Brittle deformation, in other words. Steve Reynolds interprets the structural geology of the range as representing an episode of crustal extension, with deep, warm rocks experiencing mylonitization at first, then rising toward the surface and progressively colder conditions. When rocks are cold and shallow (under low confining pressures), they break rather than flow, and so in the South Mountains, we’d expect to see brittle structures (which came later) overprinting or cross-cutting ductile mylonitic foliation and lineation (which developed earlier). The overall consequence on the large scale is tectonic extension: note how the cross-sections in this trio of block diagrams get wider from earlier to younger. I can only imagine that contact is a fault. There are lots of little microfaults in there too, disrupting the contacting and giving it a stair step sort of morphology. 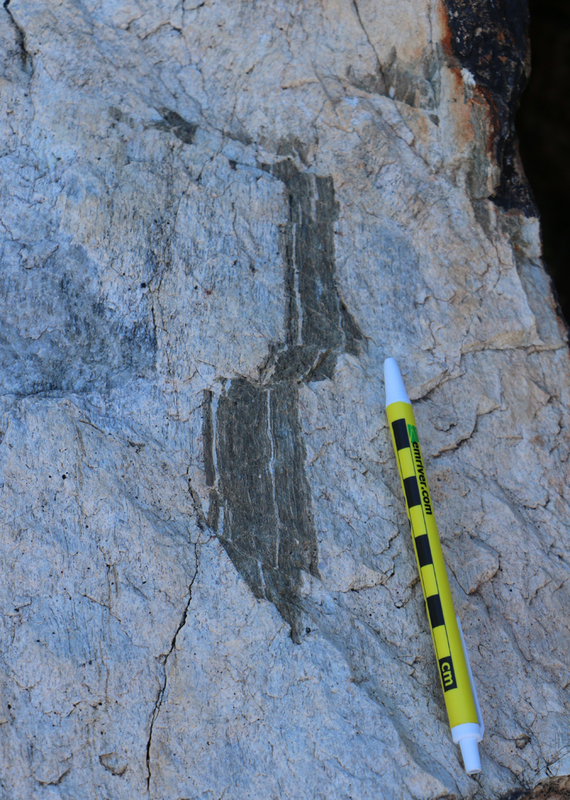 I was really struck in the field by how profoundly crisp the vertical contacts were, a clear indication there was no more subsequent mylonitization of these rocks after faulting shuffled them into the arrangement we see today. Furthermore, faulting didn’t seem to have significantly altered the orientation of the foliation (assuming it was parallel in both rock units to start with as well as after faulting had concluded), which is a little surprising. There might be some foliation-parallel slip, too. We saw that in the orientation of the pseudotachylytes I mentioned the other day. These faults, if I’m right in calling them that, are fully annealed; the modern outcrop breaks cleanly across them. They aren’t crumbly. They don’t show any cataclasis. There’s plenty of that up (structurally) above in the (map-scale) chloritic breccia. All told, these are an intriguing set of rocks and structures, and I’m glad I got the chance to explore them in more detail than when I first visited this site in January.